Er no I'm not talking about beauty products which don't have plastic ingredients in them... I mean beauty products which are not packaged in plastic. Because it seems to me that a lot of "green" beauty products come packaged in plastic containers, which seems a paradox. Why go to the trouble of sourcing and blending high quality natural ingredients, if they are then going to be packed in plastic tubes & bottles? These days, marketing a plastic bottle or tube "recyclable" isn't enough, because it's not as simple as that. As we have discovered during our Plastic Free July challenge, the vast majority of recyclable plastics don't actually make it to the recycling stage in most countries. (Only 31% of plastics are recycled in the US, for example. *1) And for those that do, when the plastic is recycled, it loses quality, so it's more like downcycling - meaning less and less of it can be cycled each time. Even more extraordinary, only 9% of plastics ever produced have been recycled. So downcycling that 9% is starting to sound like we are kidding ourselves to continue buying into the "this natural product is green and eco-friendly because it's packed in recyclable plastic" marketing. We need a fresh approach! As of 2015, approximately 6300 Mt of plastic waste had been generated, around 9% of which had been recycled, 12% was incinerated, and 79% was accumulated in landfills or the natural environment. By contrast with the down-cycling of plastic, steel, aluminium and glass are 100% recyclable - meaning they can go round and round in an endless loop without needing virgin materials to be added to them in increasing quantities each time. Certainly, we're not doing great on recycling all metal and glass either - and there's always room for improvement - but at least it seems more logical to recycle a product which can effectively become a closed loop. Plastic Pumps on eco friendly bottles? That's all very well, I hear you say, but how about pumps and lids on beauty products containers made from glass or steel? They can't be made from glass or steel. Very true - and the fact that some recycling stations can't separate out the metal spring from the plastic pump means that in these cases the entire pump goes off to landfill even if it has been placed in recycling bins. The good news about this is that there is exciting development in bio-plastics (or plastics made from plant materials instead of oil) which will break down organically. Sadly, we aren't quite there yet in commercial use, but watch this space, because with increasing consumer questions, it's an area which we feel will grow dramatically. After all, companies will make what consumers want to buy - it's simple economics. The alternative is to use beauty products which are in solid form and therefore do not require a pump, or have metal screw tops instead. And we personally believe it is better to purchase products in glass or metal containers even if they DO have plastic pumps, than to throw the baby out with the bathwater, and select the plastic bottle with plastic pump. Baby steps will change the world - they always have. Plastic free vegan beauty products like these soaps are getting easier and easier to find. Eco-friendly Soap - plastic wrapping free. "Soft Soap" in a plastic pump bottle was invented in 1980 by a marketing executive, and since then the myriad of plastic bottles with plastic pumps have become ubiquitous in bathrooms (and landfill) everywhere. Prior to the plastic pump bottle, soaps were in solid bar form, but were generally made with animal fats and petroleum derivatives. We've come a long way from that basic tallow solid soap of yesteryear, because now there are plenty of luxurious, high quality solid soaps which are not only moisturising and non-drying, but that are completely cruelty-free (ie not made with beef or sheep or pig tallow fat, or tested on animals). There's a real luxury and tactile pleasure in using quality bar soaps: and we're loving the new generation of them, which are wrapped in paper or cardboard without plastic packaging. shipping to UK & worldwide. From the soap boxes made from cardboard, to the packaging tape made from paper, & even the biodegradable packing beans, this company is serious about being plastic free. YOU CAN READ MORE ABOUT THEIR PLASTIC FREE PACKING HERE. who don't use plastic packaging for shipping. These are seriously luscious soaps - and gentle enough to use as a face cleanser. de Chalain hand make their soaps in Melbourne, with a blend of cacao butter, olive oil, shea butter and coconut oil, with French clays and organic essential oils. Made without palm oil, we discovered these soaps at a local market and are very impressed with how nourishing & moisturising they are. So gentle is this particular version, with Patchouli, Lavender and Pink Clay, that it can be used as a face cleanser. 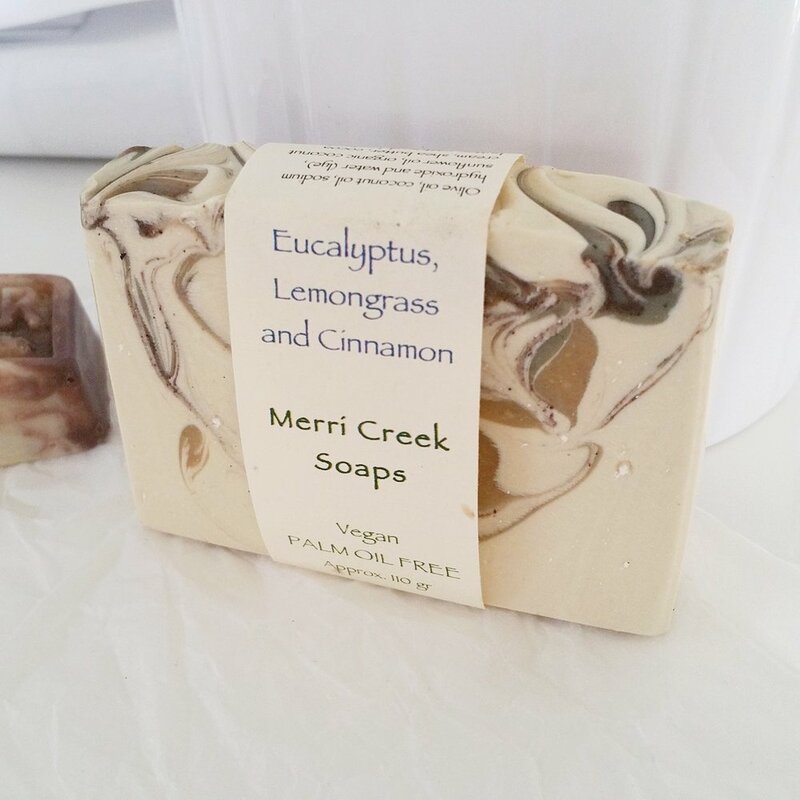 Merri Creek is another local Melbourne brand, making small batch soaps with plant based oils and butters - like avocado oil and cocoa butter - with distinctive swirls of clay and spices making fabulous patterns throughout the bars. They are made without palm oil, and made from scratch. We source ours from our beloved Friends of the Earth Food Co-Op in Collingwood, but they also have a number of other suppliers and sell direct too. Only available through markets in Melbourne, but worth a mention because they are gorgeous! With a refreshing stance on eco-friendly packaging, Canada's Elate Cosmetics takes enviro credibility up a notch. All products are vegan (certified by PETA and Leaping Bunny), made in Canada, toxin free and are packaged in sustainable materials. Lipstick in a bamboo & metal sleeve? Plant the seed paper pack in your garden & it will sprout into herbs & wildflowers. Made from bamboo, the backing is magnetic so will accept & hold the pressed eye colour, blush & powders. Elate pack their cosmetics in water soluble peanuts made from corn starch. They have a policy of not purchasing any plastic themselves, but if they receive any from their suppliers, they re-use it - with a note on their website that if you are going Plastic Free, add a note to your order and they will ensure they do their best to make it so. How does it work? The compact has a magnetic base, so it will accept and hold a new refill. The refill has a metal base, which can be fully recycled when empty - and a new refill can be inserted back into the mirrored compact. Both Henrietta and I are admirers of this vegan and cruelty free Australian made eco-luxe beauty brand - the products are some of the best we have ever used - and this option to use a refillable container makes the brand even better. As well as the cream foundation, Adorn also offer 7 other mineral powder refill products in foil pouches. Packaging is biodegradable and recyclable paper made from SFI/recycled material - so no bubble wrap and no foam peanuts. Skincare in plastic free packaging. With a full range of cleansers, toners, and face creams available in either glass bottles with metal lids, or recycled aluminium tubes, SW Basics is an American made brand with quite a cult following. Made with predominantly organic ingredients, the brand focusses on keeping things simple: from minimal amounts of ingredients per product (most are 5 products or less), to clear and simple graphic branding. We love the Brooklyn brand's philosophy of minimalism. Certified cruelty-free by PETA, all of the range is vegan except the beeswax lip balm. Amongst the Waves body lotion from Olvine Atelier is vegan, cruelty-free and packaged in a glass bottle, with a gorgeous handcrafted wooden tag.  I try to use as little plastic as possible in my life, in my home and around my child. Of course plastic makes its way in, but I find that the less plastic I use the better I feel about our health and the earth. And to make this brand even more compassionate, 5% of net sales of Olvine Atelier products are donated to Every Mother Counts, a campaign to end preventable deaths of new mothers during pregnancy and after birth complications. shampoo & conditioner in aluminium bottles that are returned for refilling? We think this is pretty close to fabulous! Now here's a novel idea: you offer vegan and cruelty free hair care products in returnable aluminium bottles, with the option to add a plastic pump to the initial purchase bottle, which can be re-used on subsequent screw-cap bottles. By returning the bottles back to Plaine Products, they clean, sterilize and refill them - and send them out as many times as possible in this loop before they are ultimately melted down and recycled. The bottles are packed in specially designed shipping cartons made by EcoEnclose - which are made from 95% post-consumer waste and 5% post-industrial waste. Ie no new materials are utilised at all in the shipping cartons, which were developed to maximise the protection of the aluminium bottles, therefore allowing them to be returned and refilled multiple times. Plaine Products are made in Florida, USA and are not only vegan, but plant based rather than synthetic based. They are palm oil free, and do not test on animals. As well as shampoo & conditioner, they also make body wash. Sadly for us, at the moment Plaine Products are only available in the US and Canada. We hope this will change as this seems like a wonderful alternative to plastic packed so-called "recyclable plastics" which rarely go on to be properly recycled. Is this the most environmentally friendly beauty product brand on the planet? We think it may well be. It's a totally solid bar system of beauty products, from shampoo & conditioners through to body soap, foot balm, deodorant, self tanning bar, body polish, body cream; to face cleanser, makeup remover, serum, scrub & moisturiser; baby soap and laundry soap. All vegan, all compostable packaging. We use biodegradable ingredients and wrappers so our solid bars leave no trace on the planet. You can pop the compostable wrapping in your compost bin. The solid bar shampoo & conditioner range includes specialised product for different hair types, from dry to oily and everything in between. Ethique products are made in New Zealand from plant based ingredients which are completely biodegradable. They are palm oil free, not tested on animals, and all the products come in a solid bar system which is packed in home compostable packaging. Certified cruelty free by PETA, Choose Cruelty Free and SAFENZ, the donate 20% of their profits to humane organisations like WSPA, HUHA and the Orangutan Project. To make those bars last as long as possible. Now that's clever thinking. Ethique even make in-shower boxes to hold the hair products which are also 100% biodegradable, as they are made from bamboo and sugarcane. Designed to keep the bars dry and last longer, the boxes will keep for up to 5 years in the shower. After that, they can be popped into your home compost, where the heat and moisture will allow them to break down via healthy micro-organisms. So there's actually quite a lot of exciting things happening in the world of plastic free beauty products. And with more and more people becoming aware of the need to avoid single use plastic, we reckon it's an exciting time for new brands to make their mark and for the established brands to up their game. * 1 Figure from US Environmental Protection Agency, "Advancing Sustainable Materials Management: 2014 Fact Sheet", published November 2016. Source here. *2 The Circular Economy is becoming mainstream.